Can I transfer my photos directly (without a PC) on the ARCHOS 2 ? Can I record video on my ARCHOS 2 ? If not what is ''Record" in the menu ? No. Record is to record your voice. Can I listen to music and view my photos at the same time ? Where are my voice recordings stored? They are stored in a folder called Record. You can see all your recordings by going to Music > Recordings. How many Photos and videos can I store on the ARCHOS 2? Photos do not take up much space, so you can store literally thousands of photos so long as their resolution is not really large. For video, you could count around 40 hours for the 8 GB model. Can I put any picture on my ARCHOS 2 and view it? Only pictures that are in JPEG format and whose resolution does not exceed 2560 x 2048. Cameras with 5 megapixels and beyond may create photos with larger resolutions. You should convert pictures to 160x128 pixels for optimum viewing on the ARCHOS 2. The CD for converting videos only works on a Windows PC, how can I convert a video to play on my ARCHOS 2 if I use a Mac? Converting a video to a format for the ARCHOS is only possible using the included CD with a Windows PC. Can I use my ARCHOS 2 to make voice recordings? Yes. Just select Record, then press Play/execute to start a recording. Press and hold the Menu button to exit the voice recorder. Select Music > Recordings to locate your recordings. What type of video can I play? The software on the CD that came with ARCHOS 2 needs to be used to convert your video files into a format that the ARCHOS 2 can read. Be aware that not all video file formats can be converted with this software. The video conversion software runs only on Windows computers. How can I get the ARCHOS to scan for FM stations and make them as preset stations? While in the Radio mode, press the M button once, and then select Scan Station. Make sure the headphones are plugged in and you are in a good reception area. Then press play/pause to start the scanning. The radio will scan the FM band and automatically memorize the stations it can receive. It will then put the radio into preset mode. My ARCHOS 2 does not have an FM radio option. Some other people with an ARCHOS 2 have FM on their device. Earlier versions of this product were sold without an FM radio included. Later versions included FM radio and thus this addition of FM was indicated on the box. How can I exit the radio menu screen? Press and hold the M button. How can I record from the radio? While listening to the radio, press and hold the volume + button. This will put the device into the record mode. Then press the play/pause button to start the recording. Press play/pause again to pause, or press M to stop and save the radio recording. You can play back the recording going to Music and selecting Recordings. How can I save the current radio station as a preset? While listening to the station that you want to save as a preset, press M and then select save. You will then use the left and right buttons to choose which channel you want to save this station as. Once you choose your channel, CH06 for example, press play. Now, when you go into preset mode, CH06 will be your preset channel for that radio station. Can I go jogging with my player? Yes, but please, do protect it from dropping! And be extremely careful when you cross streets, run in the park, or do anything like that since your ability to hear things will be impaired by the music that is playing. Can I lock my device? Yes. Hold down Menu and Vol - at the same time until the lock icon appears/disappears on the top right of the screen. What is the difference between shutting off the ARCHOS 2 with the switch on top and holding down the Play/pause button for 5 seconds? If you abruptly shut off the ARCHOS 2 with the power switch, any settings you may have changed will be forgotten and when you resume playing a song, it will not resume the last song you were playing. There are some dead pixels (or pixels stuck) on my product. Can I get my product replaced? The pixel policy is as follows. If more than 2 pixels are dead, that is, they never come on, then ARCHOS will replace your device free of charge. If more than 1 pixel is stuck on (it is always on, or stuck to one certain color), then ARCHOS will replace the device free of charge. Sometimes, when I am navigating in different applications (music, photo, video), some of the files I copied do not appear. If you select Photo from the main screen for example, it will filter out from view, any files that are not of the type .jpg. To see all the file types you have copied to your ARCHOS 2, use the option Files from the main screen. Can I connect my ARCHOS 2 to my stereo system? Yes. You will need a commonly available Mini-jack to stereo RCA cable. Turn down the volume first on your ARCHOS 2 as it may be too strong and cause distortion on your Stereo system. Can I use the ARCHOS 2 with iTunes? No. iTunes can only synchronize music from your PC to an iPod. You should use the PC program Windows Media Player. For Mac and Linux computers, simply drag and drop music files and folders into the folder ‘Music’ of the ARCHOS 2. Can I connect my ARCHOS 2 to my car radio? Yes, if your car stereo has an audio input connector. How do I know when my battery is completely changed? Safely disconnect your ARCHOS 2 as a connected hard drive from your computer by using the green arrow icon in the system tray. This will unmount the 'hard drive' from your computer. If you are on a Mac, simply eject the ARCHOS 2 disk (drag and drop it into the Trash, or press CMD+E). If the large battery icon in the center of the screen is still animated, that means it is still charging. If this large battery icon is a solid icon, this means your battery is fully charged. Can I use another set of headphones with my ARCHOS 2? Yes. Be careful though as it is slightly possible that other headphones could render the output volume beyond the maximum 100 dB which is the limit required by some European countries. See the hearing damage warning in the user guide. What are the various settings that I can Change? See the user guide for an explanation of the settings and what each one does. Can I use the ARCHOS 2 with a Windows, Mac, or Linux computer? Yes. The ARCHOS 2 can be used with these computers since they all support Mass Storage Class devices. The video conversion software runs only on Windows computers however. Can I delete files without having to connect the ARCHOS 2 to a computer? Yes. From the main screen, select the option Files, then find and highlight the file you want to delete. Press the [volume -] button, and then use the left button to select Yes, and then press the Play/execute button. The file is now deleted. Folders themselves cannot be deleted. Can I charge my player and listen to music at the same time? Yes. To listen while it is charging, dismount the hard drive by clicking on the green arrow icon in the system tray. This will allow you to take control of the device while it is still charging and play music. Can I use a Micro-SDHC card? Can I use my device to store any type of file? Yes. You can store any file that you want in the DATA folder. It is useful for storing files that you may want to use at home and at work (like a USB stick). If you store a music or photo file in that folder, it will play when clicked on. I really don’t understand files and folders and sub folders stuff, is there an easier way to put music and photos onto my ARCHOS 2? Yes. Use Windows Media Player that comes with your PC. The Sync tab in this program allows you to put music onto your ARCHOS 2 directly. Can I delete songs from my ARCHOS? You can delete individual songs by selecting Files from the main screen, and then going to the Music folder and selecting the song and pressing volume – button. By selecting Yes, and then pressing the play/pause button, the selected song will be permanently deleted. How does the lyrics function work? Can I delete songs or files from my ARCHOS? You can delete individual songs by selecting Files (fr: fichiers, de:Navigation) from the main screen, and then going to the Music folder and selecting the song and pressing volume – button. By selecting Yes, and then pressing the play/pause button, the selected song will be permanently deleted. What does ‘Update’ do in the Media Library? It scans through the entire internal memory and rebuilds the music library listing. This way, if you have recently copied music to your device, it will take these into account. This is usually not necessary as the device will update automatically when you unplug it from the computer. When I put a Micro-SD card into the ARCHOS 2, it doesn't show me all the songs in the music library, even if I select 'Update Library.' What's wrong? To play the music on your Micro-SD card, go to Music > Files > SD card and then select the desired music tracks from there. Why do I sometimes see when I select Album or Artist in the Music library? This is because the ARCHOS 2 could not find any valid Artist or Album tags inside of the MP3 or WMA music file. I don’t see lyrics for my songs. What’s wrong? Lyrics for songs will only display if the lyrics file has the same name as the music file and is in the same folder as the associated music file. Is my player compatible with my purchased DRM-protected music files? No. 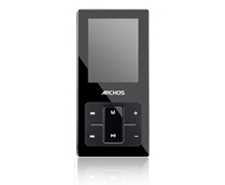 The ARCHOS 2 plays MP3 and WMA music files that are unprotected only. Depending on how your songs are encoded (MP3, WMA, bitrate, etc.) you can store up to 4000 or more typical songs on the 8 GB model and 8000 songs on the 16GB version. Where can I find legal music to download? There are a number of services on the web that allow the legal downloading of unprotected music files. Some are free (ex: www.jamendo.com) while others require a small subscription charge (ex: www.emusic.com). I've added music files in my ARCHOS 2. But I don't see them. What is wrong ? The ARCHOS 2 will play MP3 and non-protected WMA audio files. Music that is in the AAC format, a format commonly used with iPods and Macintosh, is not playable. Once you have put music into the Music folder on your ARCHOS 2, select Update in the music list selection to ensure that the copied music gets added to the music library. Note also that music files are filtered from view when you choose Photo or Video from the main screen.